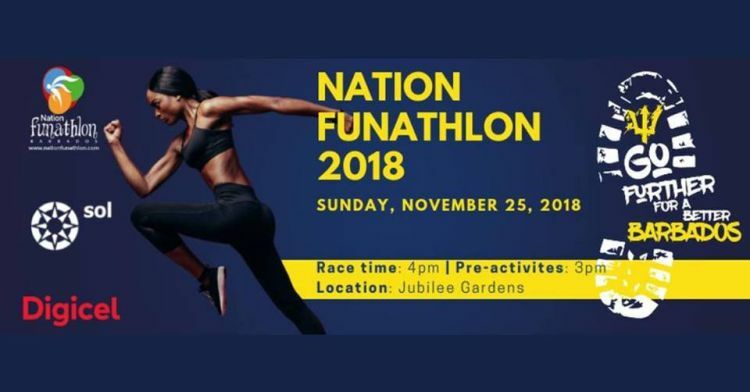 The theme for this year's Nation Funathlon is Go Further For A Better Barbados. Thousands of enthusiasts take part every year. The event will begin and end in Jubilee Gardens, Bridgetown. The aim of this charity walk and run is to drive awareness of the negative impact violence has on our community and encourage persons to strive to build a better Barbados and support causes with positive preventative and intervention programmes. Route: On Cowell Street (facing Courts Barbados) lined up to door on building and corner of Jubilee Gardens, head straight and take left turn unto George Street. At the top of street turn left on to Prince Alfred Street and then right unto lower Broad Street. Follow the road unto the traffic lights and turn right unto Bridge Street (past the Bridge Street Mall). Proceed straight unto Highway 7 (pass fire station) and then right unto Bay Street. Proceed straight through Independence Arch over Chamberlain Bridge and then left unto Wharf Road. Stay on the straight to Hincks Street and then Princess Alice Highway, then after Pelican Village turn right unto Prescod Boulevard (Harbour Road). Proceed to roundabout and then turn right unto President Kennedy Drive towards traffic lights at Holborn. Turn right unto Fontabelle and proceed straight unto Cheapside road, follow road toward City Centre and proceed into Chapel Street. At the top of street turn right unto lower Broad Street. Race ends by the decorative lamps. For more details on registration, visit http://www.nationfunathlon.com/ . The Accident & Emergency Dept. of the Queen Elizabeth Hospital and the Nature Fun Ranch.